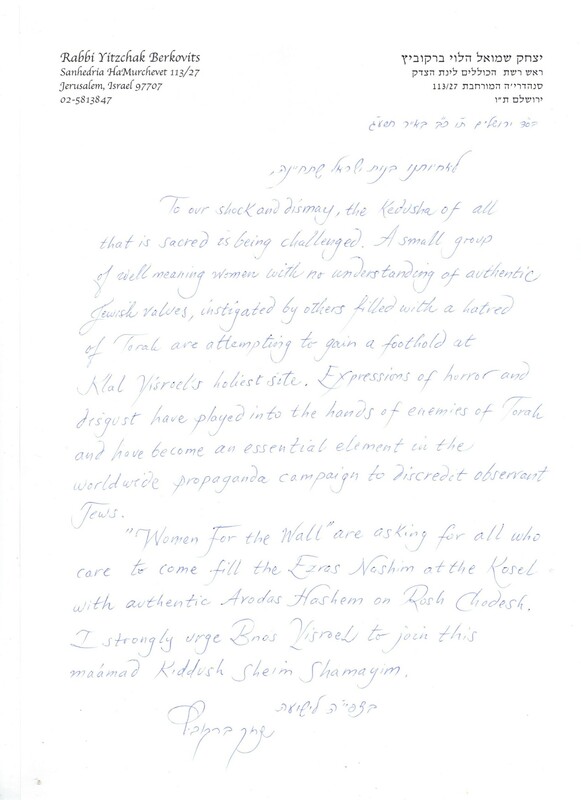 Today on the website of Women of the Wall, Rabbi Iris Richman claims the mantle of prophecy. But she is mistaken. None of us are “jubilant” at having caused “the exile of Jews in our homeland” — primarily because we haven’t. Today we are even exiled from many Jewish women. What of the Women for the Wall — the copycat-named organization started in April when WOW won the legal right to pray at the Kotel, with the purpose of preventing and exiling WOW from the Kotel and prayer? Today, Rosh Hodesh Av, they are jubilant at their success in bringing about the exile of Jews in our homeland. There was plenty of room for you to join your sisters in prayer. We would never imagine excluding a woman based upon how she was dressed. The accompanying photo was taken today at the Wall (before it got quite so crowded). An interesting side point: last month, women truly were barred from entry. Based simply upon the clothes they were wearing, women were not even permitted to enter the Old City to bring their children to school. 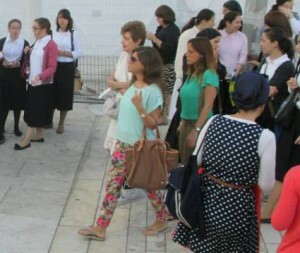 The response of the Women of the Wall was nothing but high praise for the way police addressed that situation. You in particular seemed to have no similar lament for the fate of a group far larger than your own, which was not simply prevented from reaching the plaza as a group, but from entering the Old City at all. That was not the case this month, when again your travels were given the VIP treatment, but the crowds were simply too large. 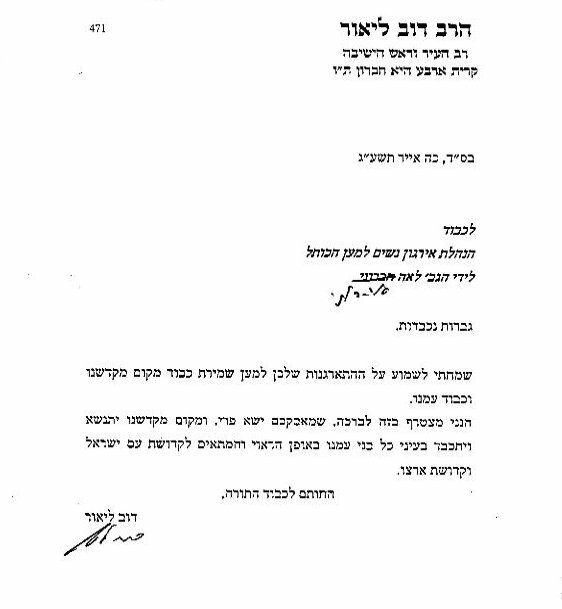 The only thing you were unable to do was to separate yourselves from your sisters, in order to present your monthly message that we have “secondary status,” and start a “revolution.” What you have failed to understand is that this message is offensive to most Israelis, not merely the Orthodox ones. You have never wanted “women’s rights” against the rabbis, but the right of your small group of women to trample the rights of thousands of other women to pray in peace. If prayer had been your goal today, there was no exile. You would have returned to Robinson’s Arch as you have so many times in the past, the place provided by Supreme Court ruling for alternative forms of prayer. You would have prayed facing the Wall, and prayed quietly. You did none of those things. You stood your ground, stopping only when the police insisted. You then prayed facing the media, and those leaving the Western Wall — quite literally praying against them, not with them. You demonstrated in actions far louder than words that people and not G-d were your intended audience. You did everything possible to maximize the provocation and offense, in order to be able to promote the fact that one or two individuals out of some 9,000 reacted inappropriately. Nonetheless, we are pleased to note that you have finally referred to us by name, and not simply as “a fringe group” as WOW did for the past few months. I guess we’ve moved beyond the time when your colleagues refused to even consider that women — yes, women — might have started what Torah leaders from every segment of Israel’s diverse religious community then endorsed. What you are recognizing is that it’s not we who are the fringe. We represent the vast majority of those who pray at the Western Wall on a regular basis, and Israeli consensus over what the Wall represents. And to borrow a line from Anat Hoffman, we’re not going away. We honestly hope that next month you will pray with us, not against us.